Home/Daily Mail Advertisers, Online advertising, Programmatic advertising, Stop Funding Hate, The Daily Mail/Online advertisers are deserting the Daily Mail. Now let’s ramp up the pressure. In recent days, a string of online advertisers have dropped the Daily Mail. This follows an outcry over Friday’s article targeting British Olympic hero Tom Daley, which was widely seen as homophobic. Borrowing tactics from the hugely successful US-based Sleeping Giants campaign, #StopFundingHate supporters on Twitter have been taking screenshots of the adverts on that article, and tweeting them to companies to let them know where their brand is appearing. In response, Center Parcs, Club Med, Above The Stag theatre, Smarty Mobile and Sadlers Wells Theatre have stopped their Mail Online advertising, while EA Games, Natwest, Carphone Warehouse and others have publicly distanced themselves. This has been the biggest ever week for the #StopFundingHate campaign. Never before have so many companies announced that they are pulling their ads – or dared to be so publicly critical of the Daily Mail over its divisive coverage. The Mail’s attacks on other companies that have walked away – and on Stop Funding Hate supporters – have failed to deter more advertisers from leaving. The campaign is working because the brands we shop with care what their customers think – and because social media gives us a channel for speaking out that simply didn’t exist until recently. 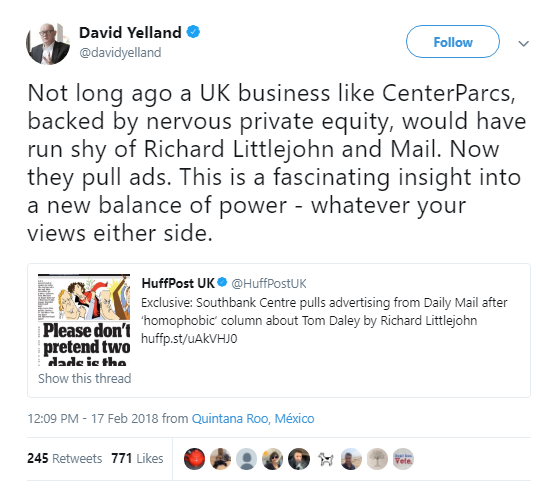 This week, the former Sun editor David Yelland commented that “Not long ago a UK business like CenterParcs… would have run shy of Richard Littlejohn and Mail”, but now there is a “a new balance of power”. With print sales falling, and more and more advertising moving online, the Daily Mail faces increasing competition in the advertising market – and it’s becoming easier for the companies we shop with to find alternatives. A brand will often be able to pull its online ads from Mail Online simply by adjusting its Google Adsense settings. In many cases the system will allow them to reach a similar audience via other websites with little or no cost difference. Can we replicate the success of Sleeping Giants? 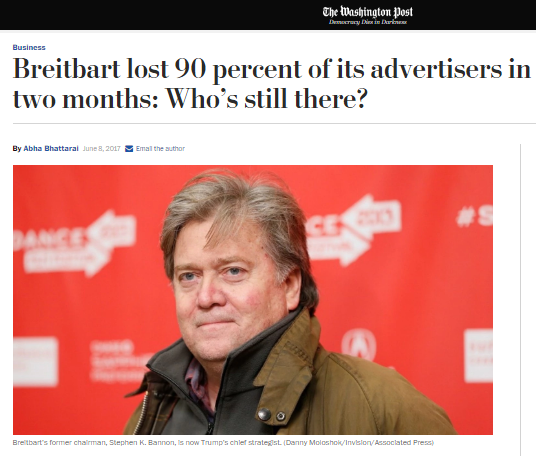 Through a strong focus on online advertising, mainly through Twitter, the Sleeping Giants campaign has so far persuaded over 3,800 advertisers to drop their ads with the US-based far-right website Breitbart. Engagement on Twitter can be particularly effective because it’s such an important channel for many brands in talking directly to their customers. And a public query made on Twitter can be harder to ignore than one received through a more private channel. 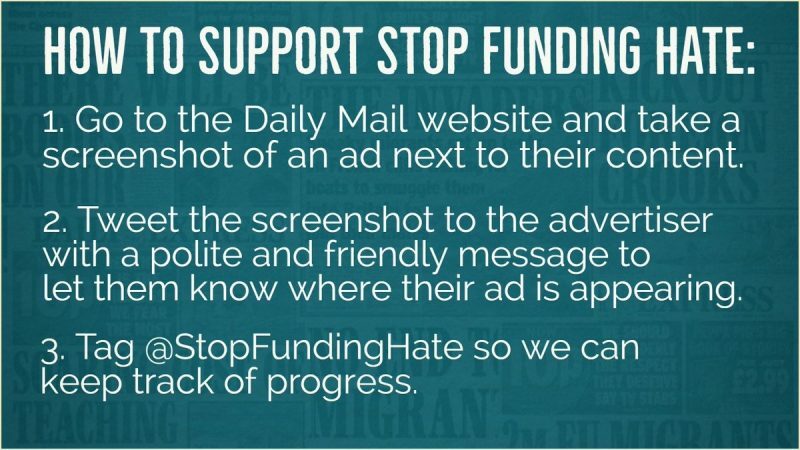 Stop Funding Hate’s recent campaign successes show that the “Sleeping Giants” approach can also work for Mail Online. Now we want to replicate this on a larger scale. Stop Funding Hate now has over 92,000 Twitter followers. If each of us takes a few minutes to check who’s advertising on the Daily Mail website, screenshot the image and let the company know on Twitter, this could help to bring many more brands on board. Our track record so far suggests that one of the most effective ways to support Stop Funding Hate is to take action in this way on Twitter. From past experience we know that even those who don’t respond publicly may still make changes behind the scenes. At the time of writing we can no longer see any advertisements on the Daily Mail’s column targeting Tom Daley – but they are still visible on a number of other inflammatory Mail articles, for example this one and this one. So if you’d like to help scale up the campaign, please follow Stop Funding Hate on Twitter, and let’s #StartSpreadingLove!